Have you ever wondered if your organization is getting the most out of CRM? How do industry leaders position for success? This 30 page analyst report from Gleanster explores best practices for augmenting CRM to optimize sales success. The report highlights findings from over 250 organizations and provides insight into exactly how Top Performing organizations approach an integrated CRM strategy. 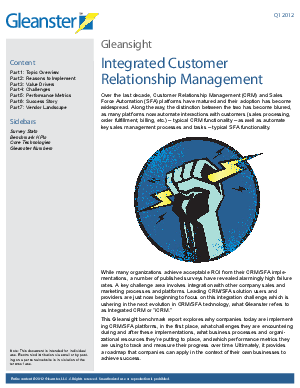 Position your organization for CRM success in 2013.